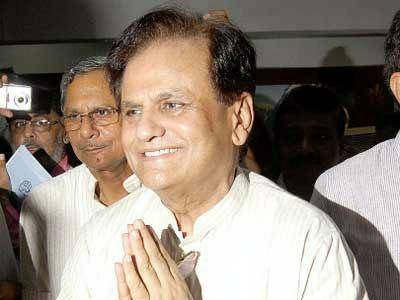 Congress veteran Ahmed Patel may be fuming over the manner in which BJP chief Amit Shah almost snatched away his Rajya Sabha seat by ensuring that 14 of the party's 57 MLAs in the Gujarat state assembly "crossed over" against him. However, two of his recent media interviews suggest that, despite his "clout" in the Congress, he has not been able to overcome his long-standing fear in taking up the reins of the party. Patel, 67, who hails from the South Gujarat district of Bharuch, may declare that he would "personally" take care of the 43 MLAs who voted for him in the crucial Rajya Sabha elections and see to it they are victorious in the state assembly polls scheduled in December. He may also boast that he would "ensure" Congress victory on 125 assembly seats out of 182. But to the question as to how is he going to achieve the twin electoral "objectives", he does not seem clear. In one interview, on being asked whether he would take the active charge of the Gujarat Congress and lead from the front, given that he has set the party rank and file a target of 125 seats (in a House of 182), he says an emphatic "No", adding, at best he would be a "facilitator". In another interview, all that he says is, he would "come to Gujarat at least four times a month" to "teach BJP a lesson." "I will keep a much closer watch and do my best possible to meet this target. I am not for Chief Ministership, if you are suggesting even something remotely like that", he tells in an answer to a probing question," he asserts. And how would he "channelise" energy into the party "since every leader in the Congress seems to be a Chief Ministerial candidate", Patel, who is considered a "key party strategist", admits: "This is a big challenge for us." Patel has been fearing an electoral battle ever since he was defeated in 1989 by a BJP non-entity by 11,500 votes from a Lok Sabha constituency he represented thrice after 1977, Bharuch. He has refused to fight an electoral battle after 1989. Whoever asked him, informally, as to why he didn't want to fight polls, he had just one answer: It is impossible for a Muslim to win a poll in a state which is so badly communally divided. On being asked whether he would take the active charge of the Gujarat Congress and lead from the front, Ahmed Patel replied in an emphatic "No", adding, at best he would be a "facilitator"
One who has preferred ever since to be in the Rajya Sabha, where all you need is a committed, fixed number of MLAs, guided by party whip, to vote for you, he has feared taking up the reins of the party, too. In an informal chat with way back in 1998, when asked why does he not take the charge as Gujarat Congress president, Patel repeated the argument he would "informally" give about fighting an electoral battle: That being a Muslim as Congress president would work "negatively" on the party's electoral prospects. Meanwhile, Patel, who is better known as political adviser of Congress president Sonia Gandhi, has begun to admit that his party is in disarray. However, all that he says to set things right following the latest crisis which nearly took away his Rajya Sabha seat is: "We will need to be careful in future, keep a close watch and look into individual grievances of party leaders and MLAs." At the same time, he brushes aside the view of Jairam Ramesh that the Congress was facing an existential crisis as a "personal observation." Asked why of all persons the Congress leader of opposition in the state assembly Shankarsinh Vaghela resigned and didn't vote for him, he just said, there is "no justification for stabbing the party in the back like this", though sounding somewhat remorseful: "We will look into the details and the genuineness of the grievances for sure". But he adds, "We learnt bitter lessons... This entire episode (of sabotage) has automatically led to purging of people whom we could not trust." So, was it a good riddance of bad rubbish?, he is asked. And his reply is: "No, no, no, don't use such words; not bad rubbish, but those who were not the party's well-wishers have left." Patel admits, "All our people, the entire party was made to feel completely helpless by the enemies very much within us," even as suggesting thar despite the disarray, there is a "will to win alone".